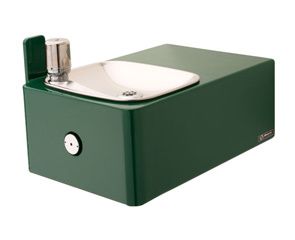 Model 1025 is a wall mounted, barrier-free, single bubbler, 11 gauge fabricated steel drinking fountain with green powder-coated finish over a galvanized substrate. Fountain includes recessed push button valve with adjustable stream control, stainless steel bowl, Model 5725 bubbler head with steel guard, vandal-resistant bottom plate, and 1-1/2" NPT trap. Waste strainer allows for top down access. Integral bracket included for mounting. Ideal for highway rest areas, correctional facilities and many other vandal prone locations. Model 1025 meets current Federal Regulations for the disabled including those in the Americans with Disabilities Act. Haws manufactures drinking fountains, electric water coolers and electric drinking fountains to be lead-free by all known definitions including ANSI/NSF Standard 61, Section 9, California Proposition 65 and the Federal Safe Drinking Water Act.